Main building of the museum. Left image: Large Lotto carpet, Western Anatolia, Uşak, 16th century. Right image: Design detail. Turkish and Islamic Arts Museum. The Turkish and Islamic Arts Museum (Turkish: Türk ve İslam Eserleri Müzesi) is a museum located in Sultanahmet Square in Fatih district of Istanbul, Turkey. 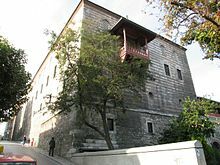 Constructed in 1524, the building was formerly the palace of Pargalı Ibrahim Pasha, who was the second grand vizier to Suleiman the Magnificent, and was once thought to have been the husband of the Sultan's sister, Hatice Sultan. The collection includes notable examples of Islamic calligraphy, tiles, and rugs as well as ethnographic displays on various cultures in Turkey, particularly nomad groups. These displays recreate rooms or dwellings from different time periods and regions. Wikimedia Commons has media related to Turkish and Islamic Arts Museum.